Our reluctant hero, as yet unaware of the fate that lies before him, logs onto World of Warcraft for only the second time from his new domicile. A night of heroic progression is the promise carried by the winds, and his assorted swords and axes are hungering for some Jin’Rokh the Breaker upon which to deliver the unrelenting fury of the frozen wastes. Carboxylate is invited to group and summoned promptly, as the <Fidelity> collective await the last of our numbers, the immovable dwarf-mountain Hagrim. But it is not to be. <Fidelity> quickly assessed our situation, and decided that without our stoic bearded lump, we would switch to normal and press Carboxylate into service as a tank. This was somewhat optimistic, as not only had Carboxylate not tanked anything since pretty-well forever, she did not as yet posses a tanking spec. A quick trip to Acherus and one blood specialisation later, Carboxylate is ready to tank practically nothing with no tank gear in her bags and no experience tanking. After some encouraging words from the raid, Carboxylate decided to have a crack at it. Her DPS gear was, at least, mastery heavy; one of the most important tanking stats for a Death Knight. Fidelity managed to pick up Lightning Overload quickly followed by a hand wipe, and then returned to down Jin’Rokh without further fuss. Horridon posed a slightly greater challenge, requiring Bioderm to change from his mage to his guardian druid to tank the Zandalari Dinomancers and keep aggro on them with stern looks and harsh words more than any actual attacks. After kind of figuring out what to do tanking here, and a liberal dose of Borgthor tanking Horridon waaay more than he should ideally be doing, and one close wipe to enrage, Fidelity mananged to pick up Cretaceous Collector. Next up was council, and thankfully Carboxylate was assigned Mar’li the caster, where her deathgrip was most useful and the incoming damage comparatively light. With some tight stacking and swift movement by all, Fidelity picked up Cage Match to give us 3/3 achievements for the night. Tortos was a straight-forward kill, and the achievement is essentially about doing the fight well, so naturally Velletara had ensured that achievement was collected weeks ago. The fight was two-tanked because Paladin, and in the end Fidelity was victorious. Thus concluded Carboxylate’s tanking experience. Rocking an impressive 160% mastery, her shields were large and imposing, but sadly only having 20% parry and no discernible dodge, those shields were fleeting. Carboxylate would like to thank Borgthor for tanking more than he should have, and for telling Carboxylate to taunt when required. Carboxylate would also like to thank Noondez for remarkable healing and only doing crazy stunts occasionally, and Kalus for delightful heals and being a top bloke. Carboxylate would like to thank Jondayla, but Carboxylate knows full well that the only heals he gets from Jondy are when he accidentally stands in green circles. I’m a little LOT behind with our boss kill posts, so just a quick one to note the passing of Lei Shen on normal for <Fidelity>. We managed to kill 9 bosses on our first night, get through Qon and the Twins quickly and dispatch Lei Shen by half way through our second night. We decided to have an early night, but not before celebrating with the Ready for RAAAAIIIIDDD?! ?ing achievement. It was a lot of fun to have everyone standing very still in position around the filth pool in the middle and launch a countdown timer to synchronise the squishing of Ihgaluk Roaches. 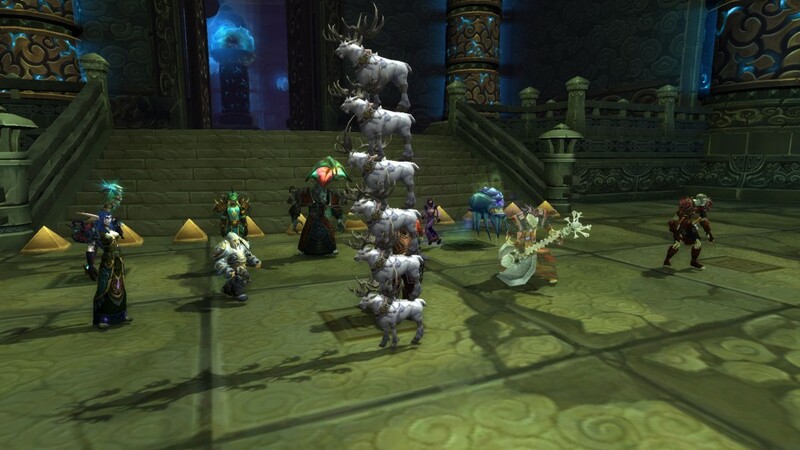 Despite the “you need 20+” comments on wowhead, 9 was plenty for us. Last night we headed back into MSV on heroic mode, and added Gara’jal, Spirit Kings and Elegon to our list of heroic kills. It was pretty amazing just how much extra DPS we had, and how that impacted the fights. In addition to the 10% nerf, Gara’jal went from ”we are so $#@%ing close to killing this” before 5.2 to “wha? dead”. Spirit Kings was a fun fight with some less than forgiving mechanics and Elegon got obliterated. I’m really looking forward to getting back in there when we have some more time to finish off heroic Will. All in all, a great week with the excitement of heroic modes coming up. I’ll be back filling our catalog of progression kills in Throne of Thunder, so keep an eye out for those.